A 63-year-old man, Korede Odubela, has been arrested by the Ogun State Police Command for allegedly killing his 16-year-old stepdaughter, Amudat Oshimodi, for ritual purposes. 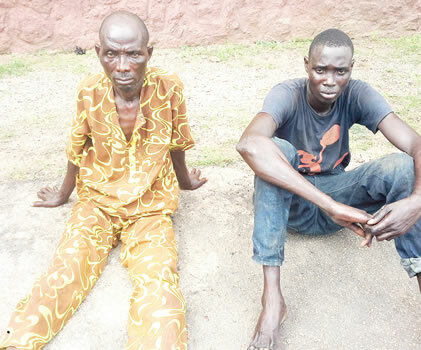 The suspect was said to have connived with another accomplice, Lekan Lawal, to commit the crime at Imosan village, in the Odogbolu Local Government Area of the state. Commissioner of Police, Ahmed Iliyasu,said Odubela, who was the leader of the gang, connived with Lawal to strangle Oshimodi, after which they sold her head and hands to ritual killers. The police commissioner said the men of the Special Anti-Robbery Squad received information about their activities and swooped on them on Monday, November 7, 2016. Odubela said he connived with Lawal to kill his stepdaughter because the 16-year-old girl was always stealing her mother’s money. Odubela said he sold Amudat’s head to his son, Seun, a herbalist who paid him N3,000, as part payment.However, Odubela’s wife, Fausat, denied asking her husband to kill her daughter. Iliyasu said the case was still under investigation, while the corpse of Amudat had been deposited at the morgue of the Ijebu Ode General Hospital.